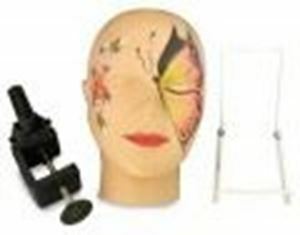 Clamp to be used with Practice Face Stain Resistant Flat Back Head (sold separately). You can also use these with the Male and Female Superior heads so that you can clamp them to a table. The polyheads also have a hole up through it so you could also use it to support the head. PLEASE NOTE THAT THE PRICE QUOTED IS FOR THE CLAMP ONLY.